Matt Littler and Darren Jeffries previously known as Max and OB from Hollyoaks, are joining us at Light House or Deaffest this Saturday! 18 months on and they are already firmly established as 2 of the nation’s favourite TV presenters . From initial slots on The Hollyoaks Music Show & Freshly Squeezed they quickly developed their own brand of presenting appearing as roving reporters on Channel 4’s 2008 coverage of the V Festival to hosting their own show at the Edinburgh Festival & presenting Orange Rock Corp for T4. 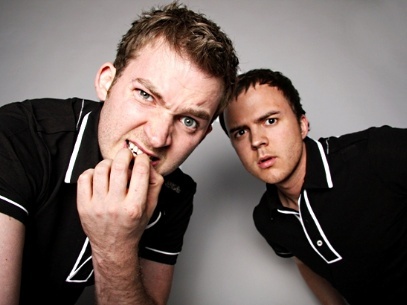 The duo also managed to develop their hugely popular radio show for Bauer’s Rock FM (narrowly missing out on a Sony newcomer nomination after only 3 months on air), presented The Clothes Show Live in Birmingham and became the faces of the Royal Air Force. 2009 has so far seen the boys becoming the faces of 4Music hosting The Versus Chart while launching their own ratings winning show “Red Bull Rivals” again for T4 while making numerous personal appearances with their own live show at venues across the UK. You can also find out more about the pair by visiting their facebook page. You can see the full festival listing here and tickets are still available for the Saturday Evening Gala Awards Ceremony by calling 01902 716 055 or visiting www.theticketsellers.co.uk and searching for “Light House” under venues. Posted by Deaffest on November 26, 2009 in News and tagged Darren Jefferies, deaffest, Matt Littler, saturday.